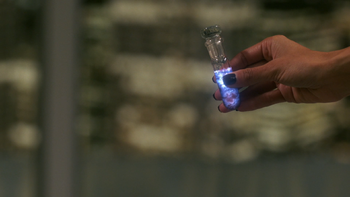 A vial of Michael's blood / grace concoction. Now, you know exactly what you want. You don't pretend to want to help people or save the world. Your want is pure and simple and clean. And that's why you are worth saving; that's why we are going to work so well together. Because you -- you just want to eat. An early failed experiment with a vampire. After possessing Dean, Michael from Apocalypse World sets about working out how to conquer this new world. Over the course of three weeks he gathers information, speaking to all manner of people around the world. Ultimately, he finds their needs and motives complex and messy. Following an encounter with a vampire that leaves him admiring its "pure and clean" need to eat, Michael commences a project of enhancing monsters through a process that involves feeding them a concoction that includes some of his archangel grace and the blood of the monster test subjects. He starts his experiments with vampires and although many die during the experimentation phase, he eventually refines the process. He is able to enhance the abilities of monsters and also reduce their vulnerability to traditional forms of dispatch. While Michael refined the process to enhance the monsters, he was not able to perfect it, as one in seven volunteers has been known to "explode" after drinking the concoction. If a monster survives, their eyes will glow blue like that of an angel as the power begins coursing through their bodies. Using his archangel grace to enhance them also gives him the ability to compel them to kill, similar to how Eve influenced monsters with her voice. Starting with the werewolf pack leader Philippe, Michael approaches different monsters and offers them a deal -- in return for having their abilities upgraded, they are to kill as many hunters as possible. After gathering enough forces, Michael prepares to turn the citizens of Kansas City, Missouri, into various monsters all in one night in order to dramatically increase the size of his army. After repossessing Dean, Michael gives his army the signal to attack, though the Winchesters had warned other hunters to be in position to fight the monster uprising in case they failed to stop Michael. After being captured by Sam, Castiel, and Jack, Michael redirects his army to the Bunker to rescue him. Several monsters are killed by Jack while Michael is locked away in Dean's mind. Maggie later tells Sam that with Michael locked away in Dean's mind and unable to control his monsters anymore, they appear to have gone their separate ways. After escaping from Dean's mind, Michael is killed by Jack Kline using the power of his soul, permanently ending his plans for his army of monsters, who are still at large. Enhanced vampires are no longer affected by dead man's blood. They can, however, still be killed by decapitation. Enhanced werewolves are no longer killed by silver bullets or blades, but can still be killed by decapitation; removal of the head is confirmed by a werewolf to be the only way to kill them. They also appear to be stronger and faster than before. While trying to gain information on Michael's plans, Garth is forced to undergo the enhancement process. He is unable to stop himself when the process causes him to attack Sam, but Sam overpowers him, and he was last seen, bound, in the trunk of the Impala. After Michael is killed by Jack, Garth presumably regains full control over himself. Enhanced djinn can read people's mind just by touching them and find out what they fear most; they can then cause these to manifest, and control them to do the djinn's bidding. They can be killed by bashing their heads in and one implies that they are still vulnerable to a silver knife dipped in lamb's blood like normal djinn. 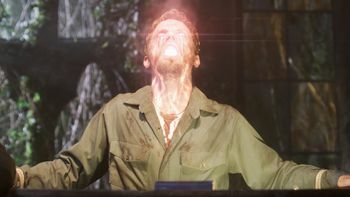 A shapeshifter enhanced by Michael's experiments displayed glowing green eyes when he revealed his true nature and appeared to be stronger than a normal shapeshifter.